Many times you want to install Windows 10 on a Mac computer with the intention of running your favorite windows games, applications which don’t have a version for Mac OS, or solve some Windows issue especially for boot-related issues. 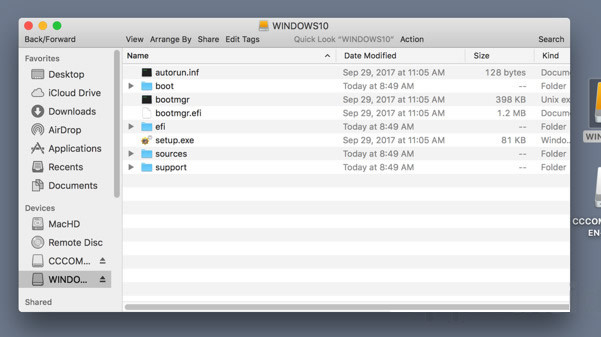 Regardless of the causes, you need to first create a Windows 10 bootable USB from ISO on Mac OS. 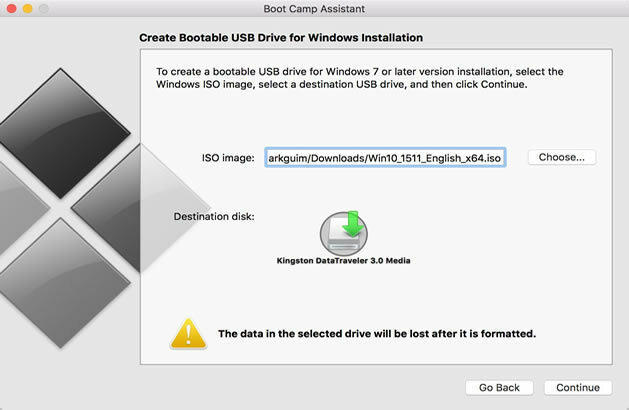 As a Mac users, you might know that Apple provides an custom-tailored solution called Bootcamp to help create a Windows bootable USB. But in fact, creating Windows bootable USB on Mac isn’t as straightforward as you think, in the creating process, naturally there will be a variety of problems. We've also received lots of emails from readers asking why Bootcamp wouldn’t allow me to use Windows 10, despite the fact that my laptop is compatible. BootCamp doesn't always work well, especially in creating Windows 10 bootable USB installation media. Another reason is Apple has already stripped the ability to make Windows 10 bootable USB in last release of Mac OS, and it is a problem because that require uses other tools. It’s believed that each software has its own pros and cons, Boot Camp is no exception. 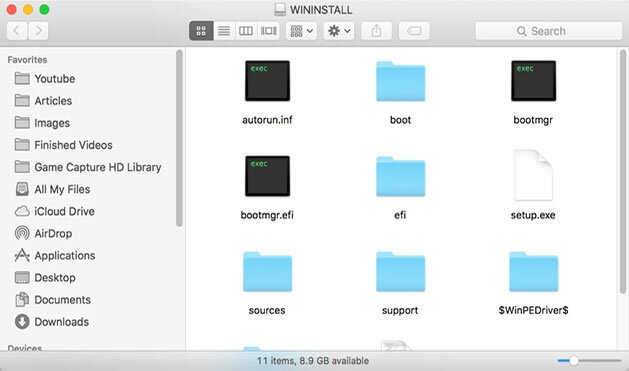 But it’s still a outstanding tool which is developed by Apple, so, this article will give priority to Boot Camp and also shows 4 intuitive approach to help you make a Windows 10 bootable USB on mac with or without Boot Cam Assistant. 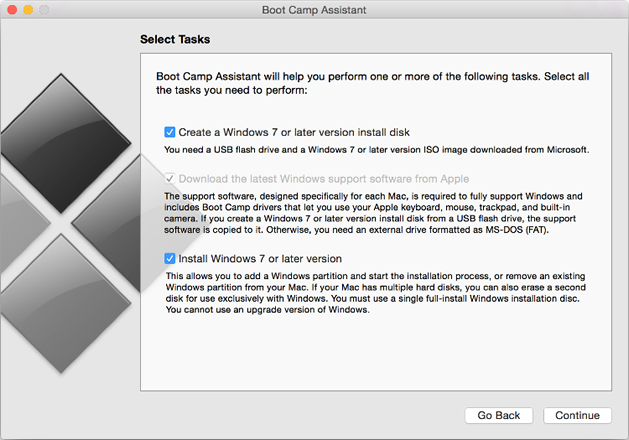 As a dual-boot booting tool, Boot Camp Assistant is highly regarded in the field of creating Windows 7/8/10 bootable USB since it was released, it provides the ability to download drivers, re-partition, and add new partition on your Mac. But sometimes you will find bootcamp tool doesn't allow any customization of the process. Before using it, you need to know that your USB installation media will be formatted as FAT32 file system, which can’t store files larger than 4 GB. Let’s see how it works. Step 1. First of all, make sure you’ve download a Windows 10, or Win7, 8 ISO image file on your Mac computer. Then you need to move ISO file to your USB drive by using Boot Cam. Step 2. Now, insert your USB dive with at least 8GB to your Mac computer, make sure you’ve created a copy for your important file because your USB will be formatted. Step 3. Launch the Boot Cam Assistant from Utilities, then check the two options: Create a Windows installation disk and Install Windows 7 or later version. Click Continue to proceed. Step 4. when you go to this step, Boot Cam Assistant will detect and locate your ISO image file, click choose button to find and import the right one, and click continue. It may take some times to format your USB, please wait. Step 5. When the process is complete, you will see that your USB drive will be renamed as WINNSTALL, this is your windows 10 bootable USB tool! Click Quit to close the app and then Eject the USB drive. That's it! You’ve successfully made a bootable USB drive with Windows 10 OS, and you can use it to configure new Windows 10 PCs from scratch. Making a bootable USB is not as easy as copying ISO file to your USB drive,it requires professional ISO writing tool to burn it to USB drive instead of copying. For Mac users, There may have many chance to encounter some unknown errors when using Bootcamp to create a Windows 10 USB disk on Mac, like Bootcamp failed to load bootmgr, not recognizing iso or usb not enough space,etc. So you desperately need to find a way to create bootable USB without Bootcamp. Fortunately, PassCue for ISO is a wonderful tool which can burn, create, edit and extract ISO files from any files, folders and operating system files. It has been adopted on a large scale by various users and widely recommended. It provides 5 key functions for your ISO operations including: Burn ISO, Extract ISO, Edit ISO, Create ISO and copy disc, it works very effectively in both Windows and Mac OS. Step 1. Get the software downloaded from above button and install it on your Mac with proper step instructions. Launch the tool with admin privileges to enable every kind of possible authorities. Once the tool screen turns up, you should see there are five functions including Burn, Extract, Cretae, Edit and Copy Disc. To make a Windows 10 bootable USB, then you need to choose the first option “Burn” and next. Step 2. As you can see, you’re allowed to create a Windows 10 bootable disk with USB drive or DVD/CD, here, just insert your USB drive to your Mac, then import ISO file by clicking browse button. Select your file format from the "System File" section as FAT, FAT 32, NTFS. Step 3. In the partition style, it provide two mode to choose based on your ISO file: MBR or UEFI. If MBR won’t boot, then change UEFI mode to create again. When all settings are complete, click Burn button to begin, it will take 5 - 10 minutes to complete the burning process. Step 4. When the burning is complete, you can open your USB drive and see there are many boot files inside it. Take out of your USB drive and try to install Windows OS on your other computers. As you can see, this method is so easy and safe! Never damages your ISO file. If you don’t find the method satisfactory and have plans to try out a different approach, you are most welcome to do so. As we mentioned above, creating a bootable USB Windows 7/8/10 on mac OS isn’t as simple as you might think. You will need Terminal tool on Mac to perform some command. Before we start make sure you have an effective ISO file and have USB flash drive with not less than 4GB capacity. Here are the steps to be performed on a Mac to create a Windows 10 USB Bootable Installation Drive on mac. Step 1. Connect your USB drive to your Mac. Step 3. Now you need to Run diskutil list and confirm the device node assigned to your USB flash media disk2. Step 4. Type the following command. Step 5. Replace /path/to/downloaded.iso with the path to where the image file is located; for example, ./windows10.iso). This command will convert the ISO file to IMG format. Step 7. Next, you need to type the command to Unmount the USB drive, then replace /dev/diskX with the location of your USB drive. Step 8. 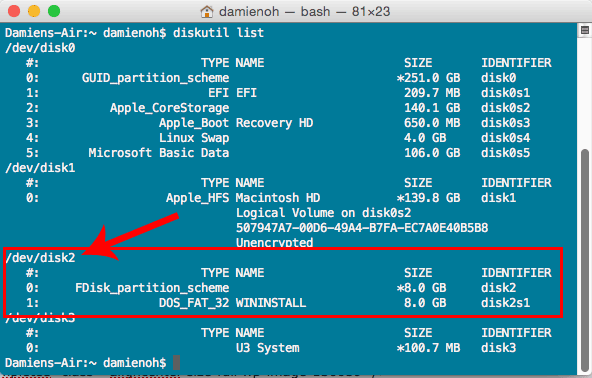 Finally, run the following command to create Windows 10/8/7 bootable USB on Mac. Once the process is complete, you can see the data will be copied and your USB will be bootable. 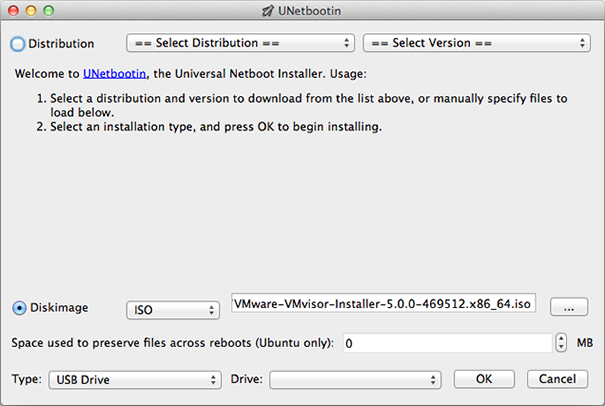 UNetbootin is free software and the latest release of new features in UNetbootin focuses on cross-platform technology that allows you create bootable Live USB drives for Ubuntu, Fedora, and other Linux distributions without a CD. It can run on Mac, Windows and Linux. Now, I will show a detailed tutorial. Step 1. Like other method 1, you can also need to check the path name of the USB drive. After you insert your USB to your Mac, open the Disk utility on Mac OS X, select the USB drive from the left panel and click Info button. Write down the USB name info for the next usage. Step 2. Now, you need to download UNetbootin tool then install it on your Mac, launch it. And copy the app to the /Application folder. Select the Diskimage button and import your ISO image file. Step 3. In the panel, select the USB drive in the Type option, and select your USB drive on UNetbootin. Click on the OK button and wait to the process end! In my opintion, It’s easy to use and doesn’t damages your system. But there still some users reported that UNetbootin is not working. Good luck to you! How to Create UEFI Bootable USB Windows 10? What's the Alternative to Rufus?